I started this *some *time ago and like many things, it got packed away when I got tired of it. Am having a bit of a tidy up of things before I get into new projects and this was begging to be finished. 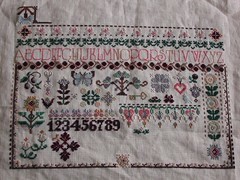 It’s a Butternut Road sampler by Marilyn Leavitt-Imblum. You can see the finished product here if you can’t wait for me to finish!